Roof Replacement: Why Tackle It Before Winter? Garlock French Corporation > Roofing > Roof Replacement: Why Tackle It Before Winter? In the Twin Cities, there’s probably no better time to re-roof than fall. Roof replacement is an excellent pre-winter home improvement for energy efficiency, but expect more practical benefits if you do it between November and mid-December. As one of the most experienced roofing contractors in the region, Garlock-French Corporation installs new roofs all year long. 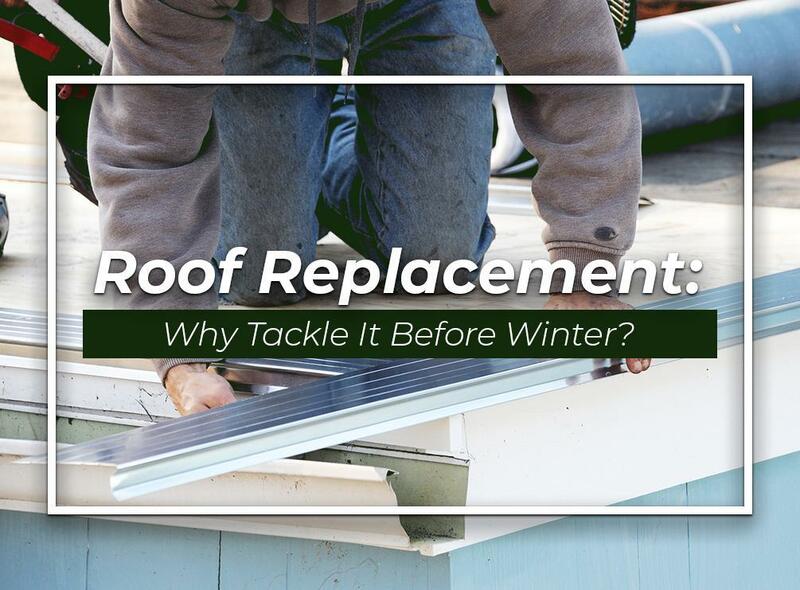 Tackling roof replacement before winter arrives, however, is better because of the following reasons. The closer winter gets, the less busy roofers become. Doing your roofing project during offseason spares you the trouble of waiting for up to a month. On average, asphalt shingle roof replacement takes about a week to complete. However, its actual construction may commence weeks after contract signing due to contractor unavailability. Few homeowners are keen to re-roof as the snow begins to fall, which is why many roofers don’t have a tight schedule halfway through fall. This is a great opportunity to get your new roofing system installed quickly and experience less disruption. It’s always better to tackle home improvements without the kids around. Children don’t like changes, not to mention mess and noise. Not being able to do their daily routine at home because of the construction can easily stress them out, not to mention you. Because fall signals the start of the school year, however, you’ll have one less thing to worry about in roof replacement. Roofers clean everything at the end of the day, restoring a sense of normalcy around the house before your children get home. First impressions count. There’s no better way to impress guests during the holidays than with a brand-new roof. From the street, dimensional asphalt shingles and sleek metal roofing panels look captivating. Don’t wait for the winter to retire your aging roof. Contact Garlock-French Corporation today to talk about your roof replacement project. We serve areas in and around Minneapolis and St. Paul, MN.